If Russell T Davies set out to leave fans clamouring for resolution after delivering the most shocking of cliffhangers Doctor Who has ever managed, then he succeeded masterfully. 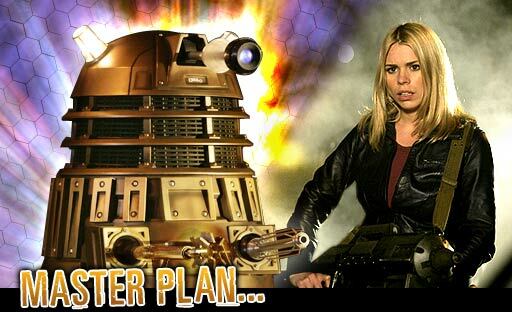 With a Dalek shooting the Doctor, leaving him in the midst of the familiar glow and burst of the modern regeneration without any sort of preview for the upcoming conclusion ‘Journey’s End,’ the entire cast and crew of Doctor Who has managed to achieve what many would normally deem impossible in the modern culture of leaks and spoilers. Nobody saw this ending coming, and though it’s unlikely that David Tennant will actually regenerate, especially with the camera panning to his hand from ‘The Christmas Invasion,’ it’s still a shocking turn of events that capped an intriguing opening instalment to the series finale. To be fair, ‘The Stolen Earth’ is not the best-scripted episode of the series. Instead, it’s a celebration of everything that Doctor Who has managed to achieve in its four years back on the air- elevating the programme from a cult following to an international phenomenon- while delving still deeper into the classic series’s mythology. It’s loud, brash, and bombastic, moving at such a breakneck speed that the gaps in logic are gone before anyone has time to question them. In fact, it would be quite easy to criticize the plot, especially for the opening act of a finale, but it achieves what it needs to and wants to perfectly, telling a story so big that it also draws upon all recognizable faces it can as various companions and spin-off characters enter the fray as well. Even if many in the casts of the much more adult-oriented Torchwood and the much more kid-centric The Sarah Jane Adventures don’t necessarily get starring roles, they do show how big and mainstream the universe of Doctor Who has become as well as how dire the situation is. As for that situation, Davros makes a very welcome return to screens as the creator of the Daleks, and Julian Bleach captures the magalomaniac’s personality and motivations perfectly in the limited screen time he had. The underlying mystery of the disappearance of the bees in this series as well as the repeated mentions of the Medusa Cascade and even the Shadow Proclamation that date back much further finally gain resolution and relevance as the Doctor finally manages to track the Earth that has joined the growing list of disappearing and missing planets, yet another lingering plot point. Even if the Doctor himself wasn’t spearheading events for the majority of the episode, ‘The Stolen Earth’ still did a very good job of setting the scene for the conclusion. After spending so much time building the Daleks up as a credible and even near-insurmountable threat, Doctor Who lets loose and simply lets them wreak havoc, taking them back to their planet-stealing roots from ‘The Dalek Invasion of Earth.’ They aren’t being reinvented, and the presence of Davros helps to take the focus off of them as the main antagonist for once as well as giving the Doctor a more organic and individual menace to speak to, showing his grim hatred for the man in a nice contrast to how he treated the Master in the previous series. Unquestionably, though, Rose’s return is the crux of this episode, and Davies surpasses himself in showing how special she is in the Doctor’s eyes. Even as all of his recent companions manage to communicate with the Doctor on the TARDIS monitor, it’s Rose that he overtly laments not seeing. Likewise, after scolding Martha for associating with the gun-toting soldiers of UNIT, the Doctor overlooks Rose’s oversized gun as they enter a slow-motion reunion run while Martha simply stands by in the background. Of course, the reunion was short-lived thanks to a well-placed Dalek shot that triggered the possible regeneration, but it will be intriguing to see how the presence of Rose is resolved since she clearly cannot stay in this universe beside the Doctor forever. That leaves Dalek Caan as the final point of ‘The Stolen Earth.’ The emergency temporal shift witnessed in ‘Evolution of the Daleks’ took him into the heart of the time-locked Time War itself, costing him his sanity in the process. Davros, of course, boasts about the ingenuity and strength of his creations, but his survival brings up two very distinct questions going forward. The first regards which of the Doctor’s companions his death prophesy refers to; the second regards just how locked away the Time War truly is. If one Dalek can break through the seal, it’s hard to believe that the Doctor couldn’t have with some effort as well. Despite the multiple scenes of regret and sorrow he has shown over recent years regarding the loss of his people, the horror he reacted to the discovery that there was another Time Lord alive in ‘Utopia’ suggests that the Doctor simply may not have a desire to go back. This may, of course, not be the case, but it’s certainly a fascinating potential that Caan’s survival has raised. In the end, ‘The Stolen Earth’ is a fascinating piece of television, a celebration of everything that has occurred over the past four years as well as reaching back to the very beginning as well. Along the way, the celebratory feel does lead to a few gaps in logic and a bit less exposition than would normally be present, but the events throughout and especially the cliffhanger ending nobody saw coming will certainly keep this story in people’s minds for a long time to come.